Factual error: Towards the end of the film, the British slaves are escaping out of the window. As they rush over to the window, one man's costume flies up. Lovely pair of red underpants he's wearing. 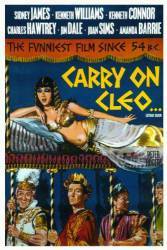 Trivia: If the props and sets on 'Carry On Cleo' look to be unusually lavish, this is no surprise. They were not made for the movie. Producer Peter Rogers just seized the opportunity of re-cycling the props and sets from the famous Richard Burton/Liz Taylor movie (the very same movie that they were sending up, incidentally). The props and sets had been left behind at Pinewood Studios when production of the Burton/Taylor "Cleopatra" moved to Rome. Trivia: Caesar's line, "Infamy! Infamy! They've all got it in for me!" is frequently voted among the funniest lines in British comedy. It has also been voted the all-time funniest one-liner in a film. Trivia: Charles Hawtrey plays Seneca, father of Calpurnia (Joan Sims). In real life, Hawtrey was only 16 years older than Sims. Julius Caesar: I've cleaned up this city. Have you forgotten my slogan? 'Nihil expectore in omnibus' - no spitting on the public transport. Mark Antony: Julie! I caught you with your toga up. Julius Caesar: Oh yes, I'm sorry I've caught something, one of these local things I can't seem to shake off. It's called "a-stinking-cold". Mark Antony: All right, look here Marcus. Spencius: No, no, I'm Spencius. 'S my brother what's Marcus. We're in partnership now, you know. Marcus and Spencius.